Real Madrid manager Zinedine Zidane has admitted that James Rodriguez’s situation at the club is a problem due to lack of game time. 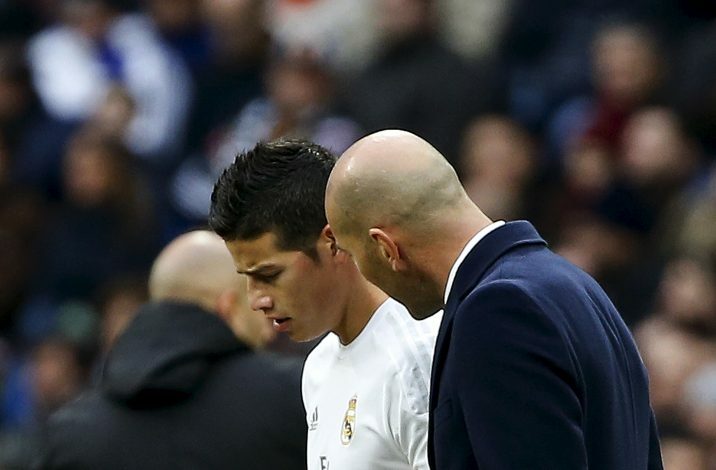 James Rodriguez is struggling to get into the team under Zidane, and he currently spends most of his time on the sidelines. The player was also an unused substitute during the recent El Clasico, which ended in a 1-1 draw. In a recent press conference, Real Madrid boss Zinedine Zidane accepted that James wasn’t happy with lack of playing time. However, the Frenchman has refused to comment on any move happening for the player in the next transfer window. The former Puskas award winner moved to Real Madrid from AS Monaco for £67.5m in 2014. He was one of the best players in World Cup 2014, and even had a good first season at the Santiago Bernabeu. However, he couldn’t convince Zidane of his abilities. As a result, other Madrid players like Lucas Vasquez, Asensio, and Isco started to get more game time than the Colombian international, who has started just 3 games for Real Madrid this season. But Zidane hasn’t ruled out any possibility of seeing James in first team just yet. “I really admire James Rodriguez, because he always trains hard and is always very helpful. I’m on good terms with him, like with everybody else here,” said Zidane. Various European teams are monitoring James’ situation at Real Madrid, and therefore, a move to a new club is still an option, amidst reported interest from Manchester United, Arsenal, and Juventus.